Meet the new Eurolab4HPC project! Eurolab4HPC is a two-year Horizon 2020 funded project with the bold commitment to make Europe excel in academic research and innovation in HPC technology. This project was preceded by Eurolab4HPC1 that started off from fragmented research initiatives for HPC systems. Eurolab4HPC1 managed to form a critical mass around the leading HPC system research institutions in Europe. This partnership achieved a lot. First, it developed a a long-term (2023-2030) vision for driving excellence in HPC systems research. Second, it developed a validated HPC curriculum and best practices in on-line learning to train future HPC computing system technical leaders. It also developed and promoted a program for accelerating innovations in HPC systems. Finally, through arrangement of many networking events, it managed to established strong links among HPC stakeholders (ETP4HPC, PRACE, HiPEAC and HPC CoEs). The second edition of this project will build on the first to take Europe to a next level when it comes to excellence in HPC system research. 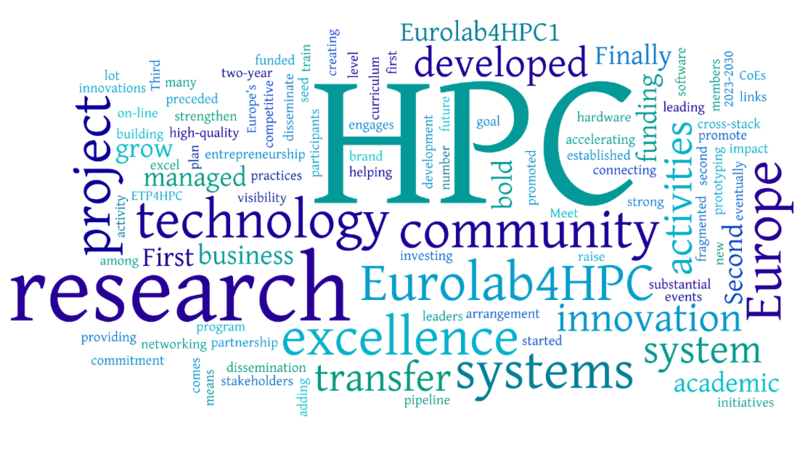 Eurolab4HPC has the bold overall goal to strengthen academic research excellence and innovation in HPC in Europe. This will be met through a number of means. First, it will grow the HPC systems community by adding members to develop a community of excellence that engages in focused high-quality cross-stack (applications, software, hardware) activity. Second, it will promote entrepreneurship by building an innovation pipeline from general purpose entrepreneurial training, business prototyping, business plan development and helping with funding. Third, it will stimulate technology transfer by connecting with other technology transfer activities and providing competitive seed funding for HPC technology transfer. Finally, it will disseminate community news by investing substantial resources in dissemination activities and creating a stronger Eurolab4HPC brand. All these activities will raise the visibility of the European HPC community, attract more participants and eventually grow the interest and impact of Europe’s Exascale research.